Beware of Darkness is a bold, new power-trio of old souls, pissed at life in a modern age. They are ready to frighten your children, sleep with your daughters, and make you shake, scream, and contort like it’s a Depression-Era Southern exorcism. They play fast moving rock songs with exploding key and rhythms changes mid-song. They also play slow-cooked, sexed-up bluesy things. Imagine Bowie’s “Hunky Dory” with low, detuned, primal Zeppelin-esqe guitar riffs. Their live shows have the emotional climaxes of a church revival; a fitting description as chief songwriter and guitarist, Kyle Nicolaides has, on multiple occasions, brought a gospel church of 200+ to their feet in standing ovation. The rhythm section consists of Tony Cupito (drums) and Daniel Curcio (bass), who share a mutual respect and admiration for Blues, Gospel, and Motown music. They all met in LA, where Nicolaides moved to escape the Santa Barbara doldrums, and Curcio (a New Jersey native) was visiting after discovering he had a long lost half brother. 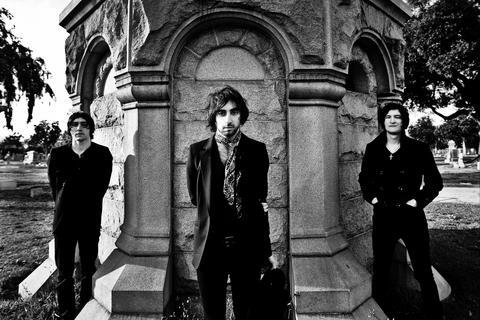 The three came together to form Beware of Darkness, taking the name from a George Harrison song, and signed to Bright Antenna in late 2011. Lyrically, Nicolaides cites literary influences, Sylvia Plath, Emily Dickenson, and David Foster Wallace. He delivers scathing lyrical content in a snarling howl tackling subject matters of depression, chaste women, pedophilic priests, and post-modern paranoia. Incredibly potent and precise, these are lyrics meant to evoke reactions. They are here to divide, conquer and seduce, and are moving awfully quick. Beware of Darkness is here. Catch them if you can.